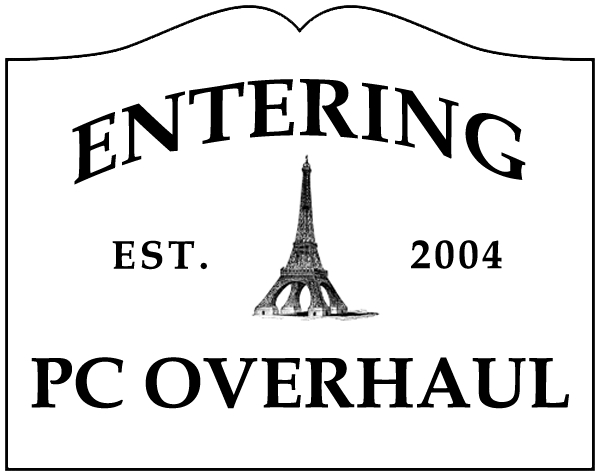 Pc Overhaul is a home based computer software repair shop located near downtown Norwood, Massachusetts. I am no longer working on any computer hardware with the exception of hard drive data recovery and hard drive replacements. For 20 years I have been helping both business and home users in the Norwood, Massachusetts area with their computer problems. In that time I have gained the trust of many wonderful local computer users. Much of my business is based on referrals from these satisfied customers, so I go out of my way to make your experience as painless as possible. I will examine your computer problem in detail (this may involve scans here at my home office and take several hours). Then I will contact you with an estimate on the cost and length of time for service as well as any potential options (repair vs. replacement for example). At that point you can decide whether you want the service done. If I do perform any services, the diagnosis is free. A $20 fee will be assessed if you choose not to have any services performed. I offer flat rates for my common services – virus removal, data backup or data recovery services and the complete PC overhaul. My computer repair service area includes Norwood, Canton, Dedham, Dover, Foxboro, Franklin, Holbrook, Hyde Park, Medfield, Medway, Needham, Norfolk, Plainville,Randolph, Sharon, Stoughton, Walpole, Wellesley, Westwood, West Roxbury, Wrentham and the rest of Norfolk County. I also service all of the South Shore, Metro West Boston and the Greater Boston Area. My home office is conveniently located near Norwood center, only minutes from I-95 and US Rt 1. You can make an appointment to drop off your computer at any time day or night. I also offer free pickup and delivery service to customers within 3 miles of my home office.